Cool temperatures, sunny skies and light winds greeted riders contesting Saturdays 54km handicapped road race over two laps of the Woodstock circuit. Limit riders Kate Wilson and Cameron Akeroyd worked well together and were hotly pursued by Valentines girls Sam, Rolly and Erin. 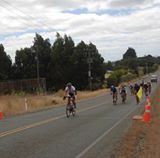 Several groups spread over 15 minutes had their work cut out as scratch riders Luke, Tom and Brehan showed no mercy. Only three minutes separated three bunches on the road with one lap to go. The Monster unleashed and Luke stormed away from several combined bunches with only Jamie Wilson able to hold the wheel and swing there for half a lap. Luke Macpherson gathered in the front group and several commented after the finish they witnessed something special as he flew passed in the fastest time of 1 hr 17 mins 50 sec. Tom Sexton rode away from the large group for second placing and Neil Familton showed very good form leading up to the Masters Track Nationals placing third. Erin “World Champ” Criglington was first female rider home. Thanks to Waine for handicapping and helping with management, Lindsay for his expert skills with traffic management, corner marshals and Crigs for looking after registrations and the loot.